Those, who literally want to take root with their target group, are well advised to opt for the Baby Tree by Green Earth Products that received an award in the category Communicative Products. 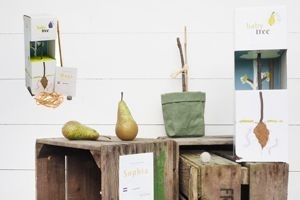 The small fruit tree is delivered inside a designer box that additionally contains the birth certificate of the “baby tree” together with an access code for the related online community. In this way, the green messengers build a bridge from the analogue to the digital world. The recipients of the likeable gift for one’s own garden learn here step by step how to plant, care for and nurture the little tree. Fruit farmers, who grew the saplings, also offer practical tips here. Furthermore, the new parents of the trees can engage in an exchange with like-minded people in the community, report about their experiences and post recipes for the further processing of the harvested fruits. The saplings that are available as apple, pear, cherry or plum trees stem from sustainable cultivation in the Netherlands and can have an imprinted label attached to them. Furthermore, the packaging can be branded via a label, advertising insert or completely in line with the customer’s requirements, the online community is also individually adaptable.